As I detailed in the first half of this article, hop alpha acids levels decline during storage. Proper handling can slow the degradation of the alpha acids, but even properly stored hops gradually lose their bitterness over time. In this post, we’ll examine if the loss if alpha acids is great enough to matter, and how to account for it if you do wish to take it into consideration. Most homebrewers don’t bother taking the age of their hops into consideration when using them. And, you don’t hear homebrewers complain about their hoppy beers becoming less bitter in the early fall (the point at which the current year’s crop would be almost a year old). So, it pays to consider whether the drop in alpha acids level is small enough that you don’t need to factor it in. To begin with, let’s take a look at US-grown Northern Brewer hops. HopUnion’s website reports that 70–85% of this strain’s alpha acids remain after 6 months. This is among the hops with better storage stability. They list the alpha acid rating of the hop as 8.0–10.0%. So, if you bought some Northern Brewer hops at 9.0% alpha acids, they should retain 6.3–7.7% alpha acids after 6 months. The numbers would fall to 4.4–6.5% after one year (assuming the rate of change remained the same). That’s a pretty big difference. However, that assumes your storage conditions match the storage conditions that alpha acid loss is measured at — specifically, storage at 68 °F (20 °C). Odds are, however, you store your hops in your freezer, over 60 °F (33 °C) colder than that. And, we known that increasing the temperature temperature of hops by 27 °F (15 °C) doubles the rate at what alpha acids are lost. If we factor that in, the alpha acid loss rate is (roughly) halved twice from the initial estimate. After 6 months of storage, we’d expect the alpha acid retention to be (approximately) 92–96%. After a year, it would be 85–92% remaining, corresponding to alpha acid levels of 7.7–8.3%. If you were brewing, say, a porter with your (originally) 9% alpha acid hops, and it was supposed to have 40 IBUs, it would end up with 34–37 IBUs using the aged Northern Brewer hops. What if we take a hop variety with worse storage stability? Many of the most popular American hops — including Cascade — have a storage stability index around 50%. Cascade, in fact, is listed as retaining 48–52% alpha acids after 6 months. For simplicity, let’s just say 50%, but that’s at 68 °F (20 °C). If it was stored at 41 °F (5° C), refrigerator temperature, it should retain 75% of it’s alpha acids (assuming the previously mentioned relationship between storage temperature at alpha acid loss). If it was stored at 14 °F (-10 °C), fairly close to standard freezer temperatures, the prediction would be 87.5% alpha acids retained. After a year, it would be 77% alpha acids retained. If you were planning on brewing a pale ale with 40 IBUs, you’d end up at about 30 IBUs using the aged Cascade hops. The easiest way to estimate your hops alpha acid content is to follow the approach I’ve used above. This assumes you’re storing your hops in a freezer. Take the original alpha acid rating, and multiply it by the decimal of the percent of alpha acids remaining after six months (as reported by the hop merchant). For example, let’s say you have some 8.0% alpha acid hops, and 55% of the alpha acids remain after 6 months. Multiply 8% times 0.55, which yields 4.4%. This is the percentage of alpha acid left after 6 months at 68 °F (20 °C). To take better storage into consideration, halve the rate of lost twice. For example, if the hops had 55% of their alpha acids after 6 months, they woulds have [(55%+100%)/2 = ] 77.5% or 78% left if you halved their rate of loss. Halving it again would yield [(77.5%+100%)/2 =] 88.75% — in other words 89% of the alpha acids left after 6 months. 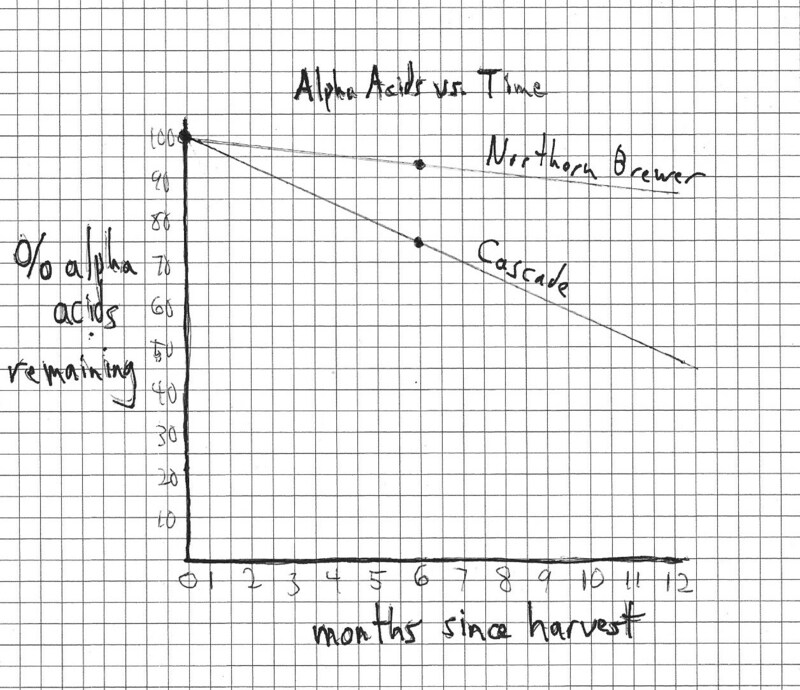 To estimate alpha acids for times other than at 6 months, take a sheet of graph paper and graph the remaining alpha acid percentage over time curve. To do that, graph a point of your starting alpha acid rating (on the package) at month zero. Then graph the remaining alpha acids at 6 months at the six months mark. (Or, graph it is percent remaining alpha acids, as in the graph above.) 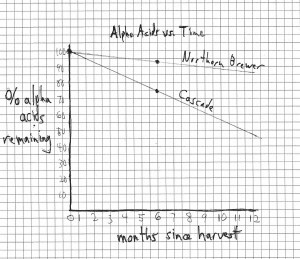 Draw a line between these two points to give your curve and use this to estimate your hop alpha acids level at any time. The upside to this method is that it’s easy. The downside is that the alpha acids don’t decline linearly, so it’s not as accurate as it could be. However, unless you want to hit your IBUs exactly, this method will get you into the ballpark of your original intentions. In the next installment, I’ll describe a more accurate method.